This weekend, we went back to Undertale and showed it what we intended to do the first time - namely, restart fresh and survive the game without any huge lingering feelings of guilt and heartbreak. It must be said that it didn't go quite as we had intended. Apparently, in addition to all the Psycho Mantis trickery that we went through above, if you're on really bad paths then you'll get additional bloodthirsty dialogue in red text and Flowey will occasionally peek out at you from the corners of the screen. All this adds up to make it clear that Undertale is an immensely clever game. I am never playing it again. It's the final part of the Undertale demo! In this, we realize what we now have to do, and head to the final confrontation, which I attempt to resolve in the most peaceful manner possible. Please have a supply of buckets for tears on standby, and curb any temptations for extreme violence towards plants that this video might unexpectedly awaken in you. It's part three of the Undertale demo! In this one, we complete our exploration of the caves and find somewhere we feel a lot more comfortable, then rapidly become much more uncomfortable again. Having just remembered I was doing these videos - here's the second part of Undertale! In this, we're left alone in the dungeon, explore the odd battle/anti-battle system and conclude with a faceoff against the eccentric ghost Napstablook. Sorry about taking the boulder voice immediately! My brain had been a bit melted by that point and I had forgotten that there were other people still waiting (and that it is dangerous for me to attempt a Texas accent). 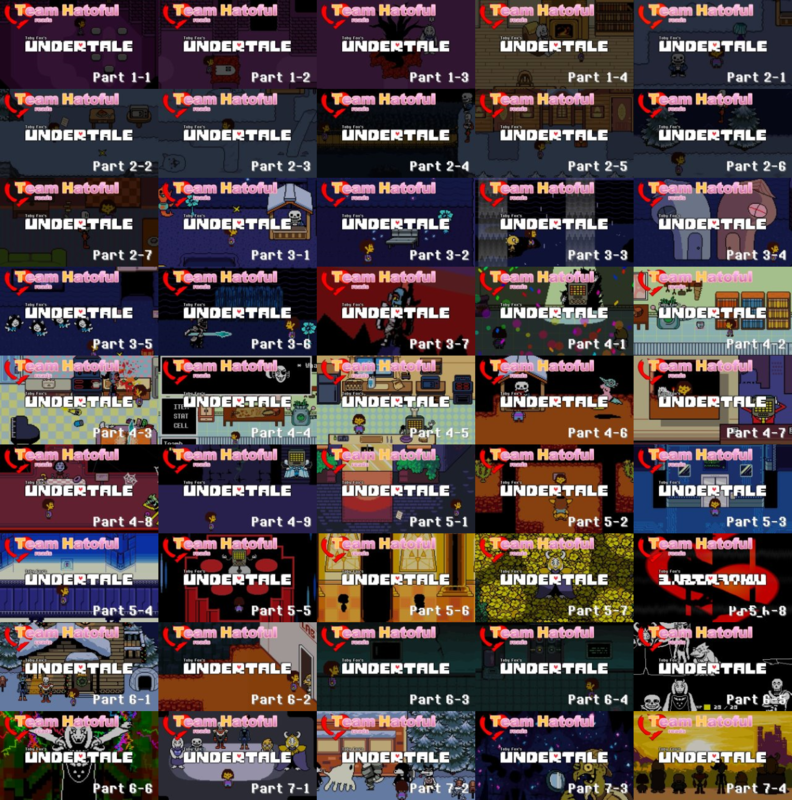 Remember when we got together to do Undertale in between all the other videos that I was in over the last week? Well, I eventually did - and as a courtesy to those who might like to see themselves, here at last is the first part! And the first video under the Team Hatoful name - I've had a go at producing a logo that mimics the game's style, but I'm trying to be aware that I currently have complete closed-box control over how these videos look in the end, so if anyone has an alternative they'd like to propose, feel free. This was a bit of a challenge to edit because it's a cross between the Hatoful style of editing where I just patch it up (including about fifteen cumulative minutes of Google-inflicted technical difficulties just in the first part) and include every spoken line, and the Stumbling style where I pick and choose the funny or notable bits. This is a very different game to stream from Hatoful - there's not so much voice acting as commenting along and reacting together. The first twenty minutes of the game are an interesting start to an RPG, where it's gradually made clear to you - in multiple layers - that things here work in mysterious ways (and so do kjorteo's vocal cords). Just when it looks like you're about to be on your own, you're mothered through the introductory puzzles, and introduced to a battle system that involves complimenting your opponent's appearance and then inviting them over for breakfast.